Less than a month before Joe Strummer passed a way The Star Spangles debut EP "Which Of The Two Of Us Is Gonna Burn This House Down?" landed in the Designer Magazine offices. The reference points were obvious, but there was still something that separated the band from just being another New York sensation. It was there behind the oxfam suited and booted chic, something in the eyes, just an inkling that these guys not only didn't fit in with the rest of the New York scene but didn't fit in with the world itself. "Bazooka", an album which was actually recorded 2 years ago, sadly doesn't live up to expectations. 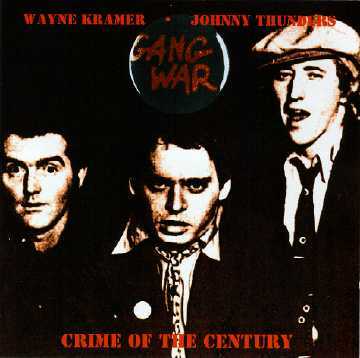 If you take a look at the cover of Johnny Thunders and Wayne Kramers "Gang War" album (click here) you'll find the answers you're looking for. Not only do they cover the artists own "Crime Of The Century", they actually model everything they do on an album which the aforementioned song apart was universally panned. "I Don't Want To Be Crazy Anymore" would be an amazing track if it didn't sound like the soundtrack from an unwritten movie of 40 year old punks heading out on the road for one last tour to see if they've still got it. On stage Ian Wilson looks like a man possessed and much of the disappointment lies in the fact that it just doesn't come across in the album. There's no signs of a troubled mind or a broken heart, just rock & roll clichés as if he's slipping into an easier identifiable role than the one he was cast on earth to play. 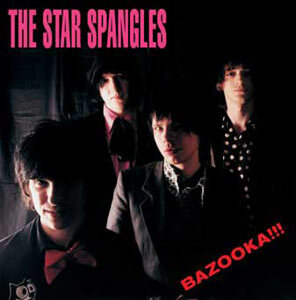 With rumours suggesting that the Star Spangles may be dropped shortly after the release of the album the future does not bode well and it begs the question why they didn't choose to include many of the new songs they'd written over the past 2 years. Their debut EP suggested that here was a band with a fiercely independent spirit, but "Bazooka" is an album which shows a band willing to compromise their ideals in order to conform. What a f**king waste!! !